Upload and share your PDF files related to Shop Furniture in this category. Some examples may be workbenches, storage cabinets, router cabinets, tools storage, shaving horse etc. Please do not upload files that are copyright protected. Only original works and or files of public domain can be uploaded to our file sharing center. All files uploaded into our community become free and open sourced to the general public to be used and distributed at will by all parties. This schema is a very interesting version of a workbench. 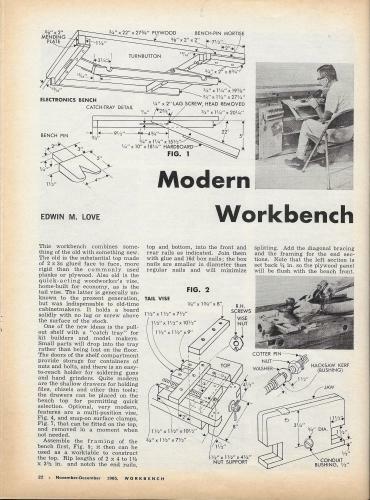 If you download and look at the schema, you'll not only have a great plan for a workbench, but you'll also see many parts that can be built separately for your own workbench, new or existing, there are quite a few great ideas in this schema. There are even details on building your own wooden vise, a very interesting vise at that. Thanks John...downloaded and saved...great stuff...will be good reading over this long winter season. Thanks for the uploads @MEBCWD! That would make a GREAT baby changing table. Maybe add a shelf for wipes. Some of these old ones are really interesting aren't they Lew? I may have to put this one in the to-do projects! Those were a blast Lew, we had one as a kid, it did not get used much, but it was pretty piece of furniture to display. Wish I still had that old treadle-powered Singer!